Sealants are an important component in some of the crucial industries that are used to seal and joint various materials including steel and polymers. In recent years, the sealants market has increased by 4% annually, on the back of growth in the major end-users market such as the construction industry. The huge manufacturing and construction industry of the GCC region is driving the growth of polyurethane sealants market by manufacturing, demand, and supply of polyurethane sealants. Materials are the building block of the construction industry and sealants is one of them. Continuous advancements in the manufacturing and application of polyurethane sealants are witnessed in order to improve the strength, longevity, durability, holding and joining features. Technologically advanced hybrid urethanes are solvent-free, high UV and color stability and excellent adhesion to metals and difficult substrates as compared to silicone sealants. GCC chemical industry is one of the oldest industries in the region, with highest growth rates shown in Saudi Arabia followed by Kuwait, Qatar, and Oman and over the forecast period, it is expected to grow at a significant growth rate. Further, there are certain challenges faced by the polyurethane sealants industry related to adverse environmental impacts. Isocyanate groups used in polyurethane sealants react with the environmental gasses which are harmful to the living beings over the long period of time. 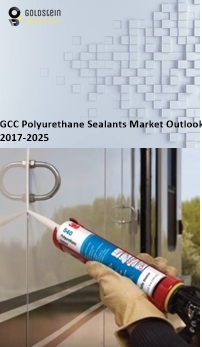 Goldstein Research analyst forecast that the GCC polyurethane sealants market is set to reach nearly USD 4.11 billion by 2025, growing at a CAGR of 4.83% over the forecast period (2017-2025). One-component polyurethane segment acquired the largest market share of 55.3% in 2017 on the back of rising demand from the manufacturing industry and the construction projects taken up in the region. Based on geography, the Saudi Arabia region accounted for the largest market share of 28.6% in 2017 followed by UAE, Qatar, and Oman. The rising investments in infrastructure, automobiles and other industries are increasing the application of polyurethane sealants in the region. The report covers the present ground scenario and the future growth prospects of the polyurethane sealants market for 2017-2025 along with the market players’ analysis. We calculated the market size and revenue share on the basis of revenue generated from major players in the GCC region. GCC Polyurethane sealants Market Outlook 2017-2025, has been prepared based on an in-depth market analysis from farm market experts. The report covers the competitive landscape and current position of major players in the GCC polyurethane sealants market space. The report also includes Porter's five force model, SWOT analysis, company profiling, business strategies of market players and their business models. “GCC Polyurethane sealants Market Report” also recognizes value chain analysis to understand the cost differentiation, pricing models to provide a competitive advantage to the existing and new entry players. Our GCC polyurethane sealants market report comprises of the following companies as the key players: BASF, Henkel, H.B. Fuller, Sika, 3M, Dow, Hernon Manufacturing, Pidilite, Construction Material Chemical Industries (CMCI), Al-Jazea, etc.